Abstract: Canine hip dysplasia (CHD) is a polygenic and multifactorial developmental disorder characterized by coxofemoral (hip) joint laxity, degeneration, and osteoarthritis (OA). Current diagnostic techniques are largely subjective measures of joint conformation performed at different stages of development. Recently, measures on three-dimensional images generated from computed tomography scans predicted the development of OA associated with CHD. 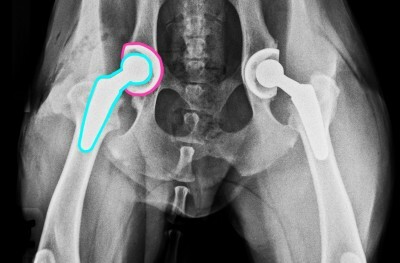 Continued refinement of similar imaging methods may improve diagnostic imaging techniques to identify dogs predisposed to degenerative hip joint changes. By current consensus, joint changes consistent with CHD are influenced by genetic predisposition as well as environmental and biomechanical factors; however, despite decades of work, the relative contributions of each to the development and extent of CHD signs remain elusive. Similarly, despite considerable effort to decipher the genetic underpinnings of CHD for selective breeding programs, relevant genetic loci remain equivocal. As such, prevention of CHD within domestic canine populations is marginally successful. Conservative management is often employed to manage signs of CHD, with lifelong maintenance of body mass as one of the most promising methods. Surgical intervention is often employed to prevent joint changes or restore joint function, but there are no gold standards for either goal. To date, all CHD phenotypes are considered as a single entity in spite of recognized differences in expression and response to environmental conditions and treatment. Identification of distinct CHD phenotypes and targeting evidence-based conservative and invasive treatments for each may significantly advance prevention and management of a prevalent, debilitating condition in canine companions.